It's time to expect more from your security system. You can have better security, increased awareness, mobile control, and new levels of interaction through an advanced security system. Get better protection with an advanced wireless communication system. Don’t be exposed to common vulnerabilities of other systems like phone/broadband line cuts, or an unpredictable Internet connection that can drop in a power outage. Get persistent protection with always-on communication that works. Exclusive "Crash and Smash" technology, developed by Alarm.com, ensures that even if an intruder is able to locate and destroy a security control panel in a “crash and smash” attack, a signal will still be sent to emergency responders, and an alert will be sent to you. In the event of an emergency, you can count on two-way emergency voice service to immediately connect you to help without picking up the phone. You already use your computer or cell phone to check the weather, view sports stats or pay the bills. Now it’s just as easy to stay connected to your home or business while on the go. 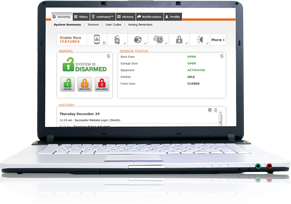 Make your security system work for you all the time, not just when it’s armed. You can be alerted in the event of an alarm, know when the system is disarmed, check in to see which door was opened, or find out exactly what time your kids came home. Unlike traditional systems that do nothing while the system is disarmed, our solutions keep you in touch with what’s going on at your property and alert you when something happens. 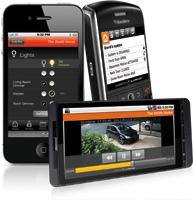 Add video monitoring to your system and get an instant view into your home or business. Alarm.com IP cameras stream live video, sense movement, save recorded clips, and trigger email and text message alerts to provide you with greater peace of mind. *With video service, you can also view live video & recorded clips through the mobile app. *With automation/energy service, you can also turn the lights on/off, lock or unlock the doors and change the temperature through the mobile app.